Great Sage is an all-vegan restaurant located in Clarksville, MD between DC and Baltimore. Over the past year, I've reviewed it twice -- in my first review, I was disappointed in a special raw meal they were serving as it didn't live up to my expectations and in the second review, the food was fine, but not spectacular. For a restaurant that claims to be the best vegan restaurant in the DC-Baltimore metro area, I expected a bit more. Their menu changes seasonally so I decided to give them another chance at their spring menu and this time they did impress. I met my mother there for dinner on a Saturday evening at 6 p.m. Although it was a holiday, I never expected them to be so busy at 6 p.m. Every seat in the house was taken with people sitting outside as well. I'm glad to see that they are doing well. I noticed a new Italian wine on the menu and decided to start with that. 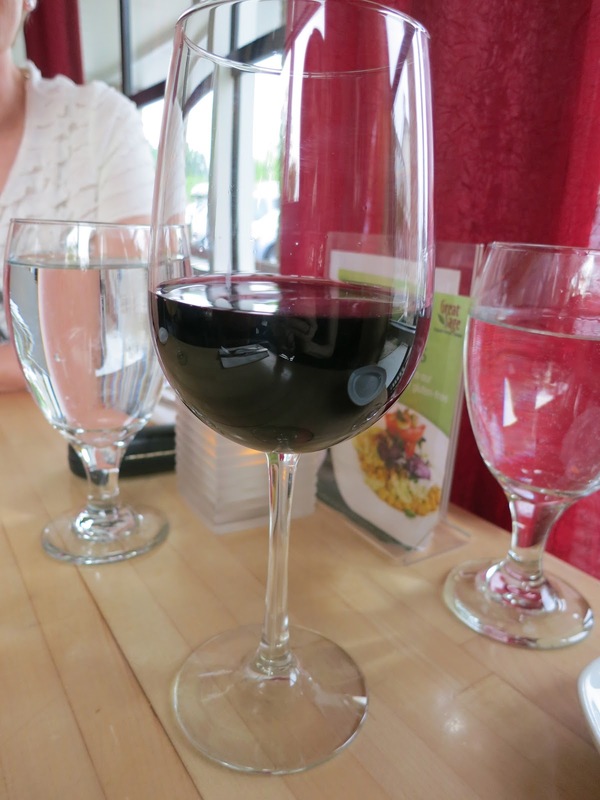 The Quattro Mani Montepulciano D'Abruzzo (2007) was a full-bodied wine with hints of cherries and blackberries. It was delightful. 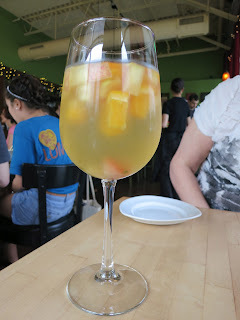 My mother had their fresh Sangria and enjoyed it as well. If nothing else, it looked beautiful! We started with an order of the Raw Beet Ravioli. These delicately sliced and marinated beets were filled with sunflower-pecan-cashew cheese and topped with a micro green salad. They were so good! And the basil pesto was the perfect compliment to this dish. I requested some bread with olive oil, which they now only serve by request. The waitress said she'd bring some, then forgot, so 10 minutes later, I requested it again. It finally came. It isn't anything special, but it gave us something to munch on as we waited for our entrees to be served. For our entrees, we both ordered the Hearts of Palm "Crab Cake." I really have no idea how they made this, but I might have to try to make it in the near future. They took grilled hearts of palm and ground them in a food processor then mixed them with bell peppers and raw red onions, formed them into patties, and either fried or baked them into crab cakes. They were stringy just like crab cakes and tasted like them too! There was a delicious tartar sauce on top and a house-made remoulade on the side - both were great complements to the crab cake. The crab cakes were also served over roasted red peppers, wilted arugula, and red onions in a pink peppercorn vinaigrette. Wow. It may not be a fine dining establishment, but this was the best food I'd ever had there. They made incredible improvements to the menu that are worth trying. I would recommend you get out there and try those crab cakes. For $17, they are pricey, but I promise you, you won't regret it. I know - we really need a restaurant like this in DC! That crab cake looks fantastic! Nice photo too. And the app--oh how I love beets. That sounds delicious. We sometimes trek up there (mostly to go to Roots) and have always had rather mediocre food and service experiences as well. It just never quite seems to come together. That said, I absolutely agree that need a decent sit down vegan restaurant in DC!